Last month of July, fourteen selected staff members of SJCH, three members of the Liberian Medicines & Health Products Regulatory Authority (LMHRA) and one member of the ‘Stella Maris Polytechnic Mother Patern College of Health Sciences’received a four-day training on ‘Good Clinical Practices’ and ‘Good Laboratory Practices’ in biomedical research.The course is part of a European-funded project (SELeCT) that aims to buildinstitutional capacities to conduct clinical trials by training hospital personnel on clinical trial conduct, upgrading laboratory infrastructure, and building community trust in health research. In addition to the presence-based training session imparted by Guillermo Martínez, project coordinator, the trainees will follow a series of online courses during the following months. 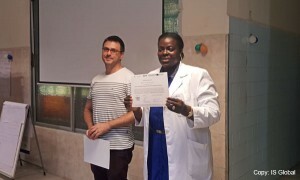 At the end of the training, the SJCH will be prepared tostart its first biomedical research activity, which will address malaria prevalence in Liberia. 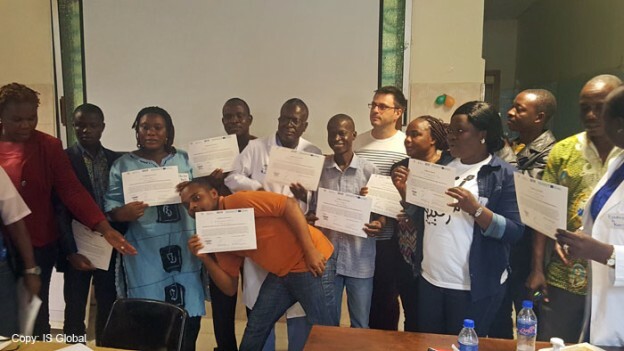 The project is also in the process of engaging with community leaders from Congo Town that will serve as a bridge between the SJCH and the population, and will help inform their communities on the importance of conducting biomedical research on diseases that affect the Liberian population. 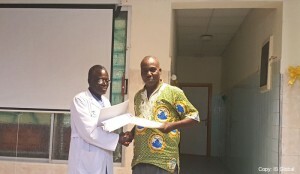 SELeCT is funded by the EDCTP (European & Developing Countries Clinical Trials Partnership) and led by the Barcelona Institute of Global Health(ISGlobal) in partnership with the Saint Joseph’s Catholic Hospital (SJCH) and the Fundación Juan Ciudad (FJC).